chapters/sections: The twelve chapters in this book are set up by weeks. Each week features a different a different farm that inspired three dishes: one appetizer, one entree, and one dessert. The featured farms are: Mountain Sweet Berry Farm, Keith's Farm, Norwich Meadows Farm, Stokes Farm, Sycamore Farms, Cherry Lane Farms, Eckerton Hill Farm, Berried Treasures Farm, Bohitree Farm, Paffenroth Gardens, Phillips Farms, and Migliorelli Farm. 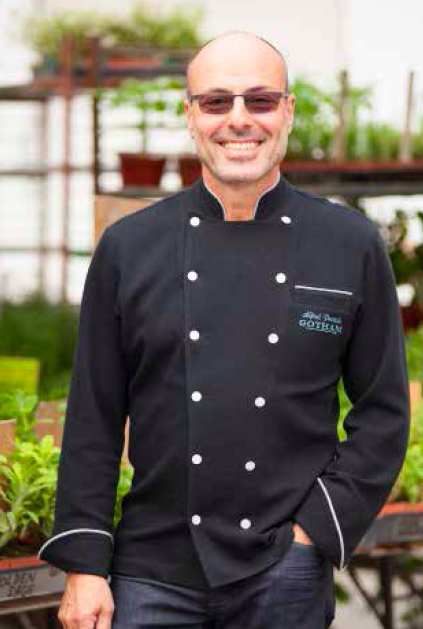 about the book: Every summer, Alfred Portale, chef and partner at Gotham Grill and Bar, creates a weekly prix fixe all-vegetarian lunch menu showcasing a different farm's ingredients. This book originated with the menus produced over the last three summers at Gotham. It also includes wine pairings, and four farmer profiles. Use this book to help maximize your local farmer's markets. 10% of the proceeds from the sale of this journal go to benefit GrowNYC. my thoughts/review: This book is simply laid out, beautifully photographed, and easy to follow. 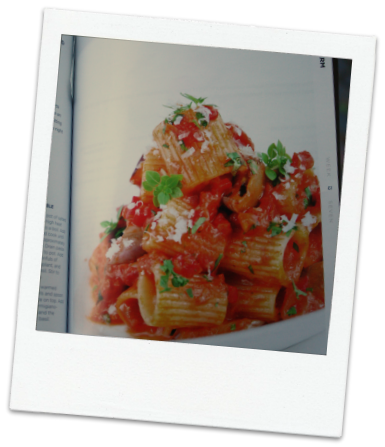 You will find recipes for all cooking levels, and vegetarian inspiration abounds. It is definitely a seasonal book but one that you'll want to refer to for inspiration all summer long. recipe I have already tried: Gragnano Mezzi Rigatoni w/ Roasted Eggplant, Fino Verde Basil, and Parmigiano-Reggiano. I wasn't able to lay hands on the exact variety of basil used in this recipe, but that didn't make it any less delicious. At least, I don't think so (but I haven't tried the original). It's very simple to make, and the meaty eggplant was probably my favorite part of the whole dish. I could eat the sauce alone. I will make this again and again when tomatoes and basil are in season. 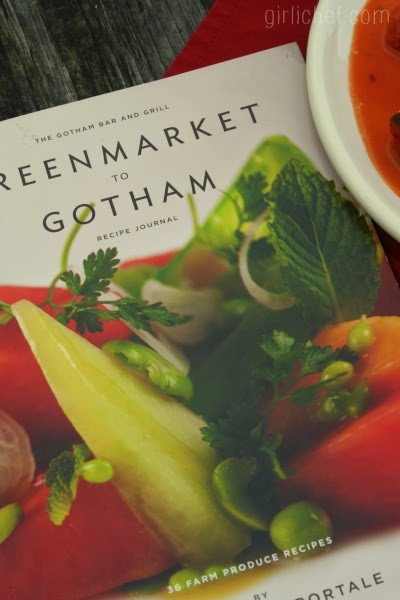 about the author: Chef Alfred Portale is the engine and chef behind the success of New York's iconic and classic restaurant, Gotham Bar and Grill. It's the only restaurant to have received five consecutive three-star reviews from the New York Times, and in 2009 was named one of the most important New York City restaurants of the past forty years by New York Magazine. Additionally, the restaurant won the prestigious James Beard Foundation Award as Outstanding Restaurant in 2002, and chef Portale was named Outstanding Chef in 2006. If you would like to win a copy of this book, simply leave me a comment on this post, letting me know what one of your favorite "Farmer's Market Meals" are. Be sure to confirm in the rafflecopter widget for your entry to count, and for extra chances to win. Open to anybody with a USA shipping address. Submissions due by 11:59 pm ET on Tuesday, October 29. Winner will be notified within 48 hours of the close of this contest, and given 24 hours to respond, or a new winner will be chosen. I received a free copy of this book from the publisher, plus an extra copy to give away. All thoughts and opinions stated in this post are 100% mine.